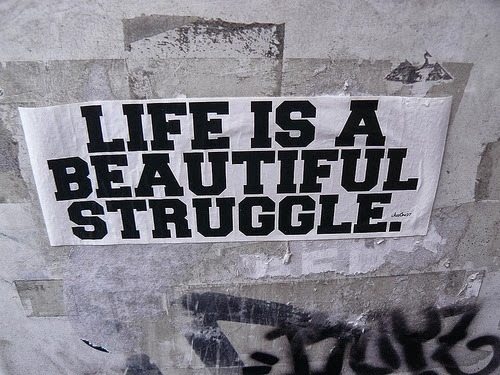 "Embrace Struggle. It is your Greatest Teacher"
I never understood that quote growing up as everything came easy for me due to my basketball skills. Many wanted to be my friend, there was virtually no peer pressure and most people were extremely nice to me during my formative years. I knew I was being treated differently due to my sports popularity, although the ease it brought to my life was comforting as it allowed me to concentrate solely on my school work and enhancing my basketball development. Obtaining a 4 year basketball scholarship to the University of Vermont (UVM) just continued the “Magic Carpet ride”. Of course struggle popped up from time to time but nothing worth talking about. After 21 years of leisure, a new city came my way and life was very different. My first 4 working years were spent in Boston, which gave me immense struggles in every facet of life. Whether it was work, relationships or the city itself, there was rarely a time when one or something new wasn’t rearing its ugly head in the form of struggle. I wrote this article about Boston and the tone leaves little doubt about my feelings. Maybe I was a bit harsh in that article, although it was how I felt living there. Subsequent visits to the city in the last 20 years have seen an abundance of good times. I realize that I had to go through the hardships in order to become a stronger person. Going from an entire childhood of bliss and lack of significant struggle, along with a wonderful college journey, made any experience after that a challenge. I’m proud I fought through the tough times and made a good life in Boston, but it was often very difficult. The highlight of those Boston years were the friendships I made. Not only did my new friends help lift my spirit, many have stayed close to me for over 25 years. I am extremely grateful for that. Because of the Boston trials and tribulations, I was a better, kinder, stronger & more prepared man for what was to come - most notably 10 fabulous years in New York City, happy travels to Europe & living as an ex-pat in Sweden. Without Beantown, I would not have been ready to tackle my diverse life. Boston was a GREAT teacher. I’ve learned not to run away from any struggles and tend to recommend that to my friends as well. If we embrace struggle, there is usually a worthwhile lesson waiting for us.